Such massive and continuous lava flow We have no way to prevent them but just escape. That Kaimu beach is now more than 50feet beneath. White smoke of background is also lave that is flowing now. From 1983 to now Lava from Pu'uOo Crater and Kupaianaha pond covered 40 square miles, made 600 acres of new land in the ocean (owner of this land is State of Hawaii) and destroyed 200 homes. This is new Black Sand Beach. One lady dreamed to make beautiful Beach with Palm grove again, and appealed to many people to bring one coconut here. It is no rare matter to see the coconut on the road side, but it is little bit heavy and big cannnot carry it in your pocket. 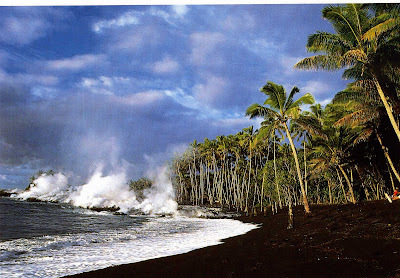 The coconut putting on the black sand sprouts and roots like this high probability. Coconut has amazing ability to survive. Yes! Her dream is coming true. We only need "time" to leave beautiful palm grove and beach for next generation. Look at this wonderful sight and feel the noble mind of all people. I heard that lady passed away by cancer that had already suffered from when she talked about her dream to others.